Last week, the Access Schools Programme at St Angela’s College, Sligo held seminars to assist students in preparing for the Irish Orals Leaving Certificate exam. Carol Gallagher, Co-ordinator of the Access School Programme reported on the success of the initiative: ‘St. Angela's College, Sligo continues to support local students as they work towards entry into third-level education.’ She noted the formal links between St Angela’s College, Sligo and local secondary schools mean students become more familiar with a third-level education environment. Participating schools in this initiative included: Mercy College, Ballinode College, St. Claire’s Comprehensive and Corran College. Almost two hundred students participated in the recent Irish orals preparation that included lectures from a number of Irish examining teachers. Students received topic revision as well as tips and techniques for the oral exam. ‘Students found the support from St Angela’s College, Sligo to be very beneficial as the approach the Irish oral exam.’ Ms Gallagher explained. 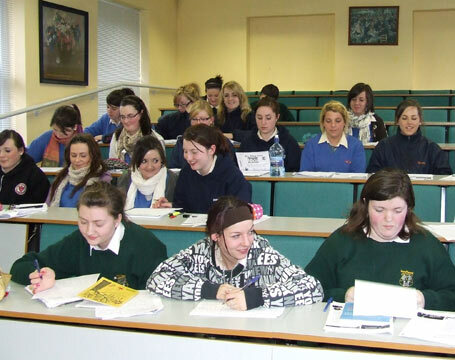 St. Angela's College, Sligo continues to provide outreach opportunities for people considering returning to education. In September, St Angela’s College, Sligo is offering a one-year Access / Foundation Course for school leavers providing students direct entry into courses at St. Angela's College, Sligo and NUI Galway. For further information please contact Carol Gallagher, Access Schools Co-ordinator 071 9195575.